British Waterways are used by a large number of people each year many of whom are not even boaters. The waterways themselves and the areas surrounding them are enjoyed by walkers, anglers, cyclists and many other outdoor pursuits’ enthusiasts. As such, they publish a number of different brochures to do with safety and guidance which point to different ‘rules’ more in terms of how to adopt best practice in terms of looking after both your own safety and protecting the environment. Here are some of the more important aspects pertaining to boaters. It’s important that you take a keen interest in conservation and preservation if you intend boating on British Waterways. You should refrain from dumping rubbish, sewage or any oily bilge water into the natural water supply or onto a river or canal bank. Likewise, any other rubbish or materials you bring with you, you should take out with you and dispose of it in the proper manner so that you leave any site behind in the same way in which you found it. It’s also crucial that you don’t damage any vegetation or cause erosion to the canal or river banks. You shouldn’t light any fires and if you have a dog with you, make sure that it’s kept under control and that you clean up after it. Additionally, if you see any pollution and the likes of any fly tipping taking place or you see fish which are obviously showing signs of being in distress, you should inform the Environment Agency and the RSPCA or RSPB, if you are witness to any birds or animals in distress or the equivalent bodies in Scotland. Always check with British Waterways first to make sure that you have the permission and any necessary permits for activities like fishing and cycling as well as your boating permit. British Waterways requests that you and any other person operating a boat understands how to operate it properly as well as knowing how to navigate tunnels, bridges and locks. It also requires any children along with any non-swimmers to always wear a life-jacket or some other kind of buoyancy aid and to supervise younger children at all times. Unless you’re informed otherwise, swimming is also strictly prohibited on British Waterways and you should have sufficient first-aid knowledge and appropriate first-aid equipment as well as having some understanding of what to do if you encounter an emergency situation. 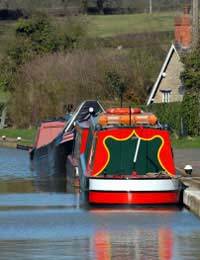 When mooring up, pay attention to mooring pins and ropes and ensure that they are not a danger to anybody who may be using the towpath. Better still, make them conspicuous by using some kind of marker. You should also avoid causing obstructions at bridges, locks and other turning points and slow down when you’re passing moored boats or those which are unpowered in order to avoid creating a breaking wash of water. Remember to also turn off your propeller once you have safely moored up. Pay close attention to any signs that have been put up regarding fishing competitions taking place in the area and when passing anglers reduce your wash whilst maintaining a steady pace in the centre of the water channel, unless the anglers advise you otherwise. You will have a far more enjoyable experience using British Waterways if you follow their guidelines and it’s easy to download particular publications from its own website which contain far more information relating to your specific needs. We do not hold such information. You would have to get in touch with the agencies directly. Please send me by post all the term and conditions of the British waterways and the environment agency rules and regulations on living and using a motorise boat. I would like to have a custom house boat made and would like some information around height width restrictions. Can anyone advise?